Kelsey Crowe, Ph.D., founded Help Each Other Out and is a breast cancer survivor. She earned her doctorate in social welfare at the University of California, Berkeley, and teaches social work at California State University. Kelsey is originally from Brooklyn and lives in San Francisco with her husband and daughter. You can find her online at www.helpeachotherout.org. Emily McDowell is not a doctor. 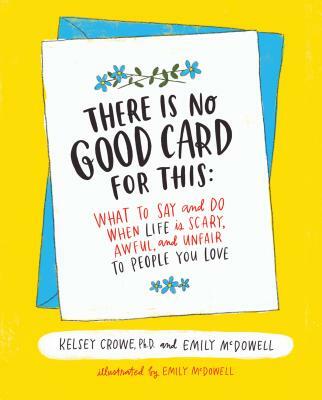 She is a writer, illustrator, speaker, and the CEO of Emily McDowell Studio, making greeting cards for the relationships we really have and products that speak to the people we really are. In 2015, she created Empathy Cards, for people experiencing major illness, grief, and loss. She and her work have been featured in the New York Times and on Good Morning America, NBC Nightly News, and NPR’s All Things Considered, among many others, and in 2015, she was named by Slate as one of “Ten Designers Who Are Changing the World.” Emily lives and works in Los Angeles, and you can find her online at www.emilymcdowell.com.